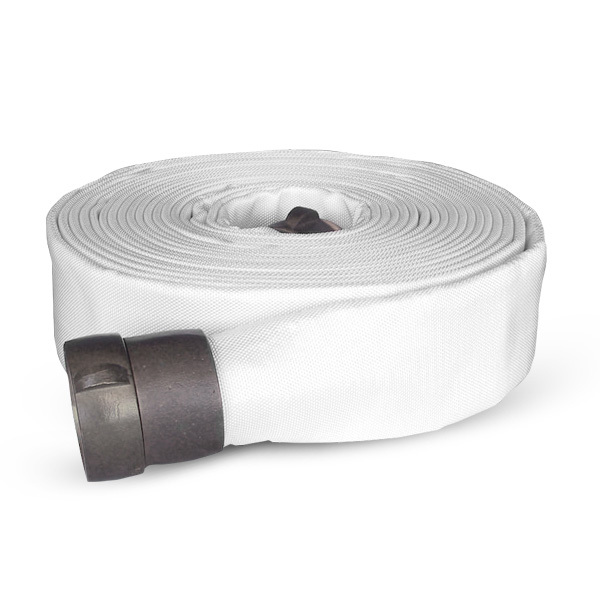 Our Type 1 layflat Double Jacket N Fire Hose is a general purpose all synthetic layflat delivery hose complying with NFPA 1961 standards. The hose is a two-component system consisting of a black SBR synthetic rubber inner lining and a synthetic polyester jacket, bonded together with NBR-synthetic adhesive. An additional polyester outer jacket then provides extra resistance to abrasion. Its abrasion resistance properties provide contact resistance to oil, fuel and chemical products along with ozone weather resistance. The two component lining system guarantees a smooth surface and low friction loss for a long service life with minimal maintenance requirements and easy repair. The Double Jacket N fire hose is characterised by its long service life, flexible and kink resistant structure produced with very low twist and small coil diameter. It is a multipurpose hose suitable for a wide range of applications. The Double Jacket N Type 1 layflat fire hose is principally used by Municipal and Industrial fire brigades. However it is a multipurpose hose also commonly used within the shipboard and marine industry, on refineries and construction sites, general industrial and with snowmaking equipment. If you are unsure of this products suitability for your requirements please contact one of our expert team for advice. The inner and outer hose jacket is a 100% polyester high tenacity yarn with circular woven, plain weave. The hose lining and cover is a two-component system consisting of a black SBR synthetic rubber inner lining and a synthetic polyester jacket, bonded together with NBR-synthetic adhesive. Resistant to ozone and to external contact with oil products. The lining guarantees a smooth surface and low friction loss. All standard lengths can be supplied from stock, however RHL specialise in the cutting and assembly of non-standard lengths up to 100 metres long to satisfy customers individual requirements. Maximum loose hose length is 300 metres and is made to order. It Complies with NFPA 1961, FM standards. It can be coupled with BS 336 Instantaneous, Storz or all international coupling types wired-in for safety and security, with 1.6mm Stainless Steel wire. adaptors and valves to meet British and International standards. Our knowledgeable team are here to help. Call us on 01772 651550 or fill out an enquiry form today. Richards Hose Ltd has long been established as a market leader in the manufacture and supply of quality of layflat hoses, hardware and fittings. Our expert team can help you find the best equipment for a wide variety of uses including the firefighting, marine, agricultural and industrial sectors. If you have any questions or would like to place an order please complete the below enquiry form.